It is the fifth Wednesday of the month! Time for an excerpt from my latest WIP! Enjoy! Courtesy Turn is a romance novel for the ...um...senior set. The main Character is a widow in her late fifties named Dottie (so far). “I didn’t tell you this, Carol, but for a bit there, I thought someone was stalking me.” Dottie looked up to see if her friend was laughing at her. No, thank goodness. Dottie spent the next few minutes outlining details of the mysterious car tailing her through the darkened woods. Funny. It sounded better when I told the cat. “Then the very same car came to my house late the other night, pulled in my driveway with the lights off, and then pulled away suddenly. Just lucky I was across the street with Angie.” It was an embellished version, but sounded more menacing that way. She threw in an exaggerated shiver for effect. “Did you get the number on the license plate? Or the make and model of the car?” Carol was very thorough. She watched all of the latest crime shows on television. When Virginia called in the afternoon, Dottie’s fear that Carol would tell others about the stalker was verified. With each telling of the story, Dottie became more convinced all of it was mostly her imagination run amuck. The two sat in silence for a moment. I wish my kids lived in California. I’d move where it’s warm in a heartbeat. Once she hung up, Dottie located a pencil and jotted “pepper spray” on the running list of groceries she kept hanging on her refrigerator. Not a bad idea. Even if most of my fears are in my mind. note to ask her new neighbor the next time they talked. But of course the day went by without even seeing Angie. By the time the weekend rolled around and Dottie thought the girl might be home for a while, she wasn’t. “Out shopping,” Danny told her. There was, of course only one thing to do. Go to the store and ask. She needed a few grocery items anyway. She’d stop at the grocery and then head to the anti-stalker store, wherever that might be. Surely someone at the grocery could tell her. Grateful for the sunny weather and clear roads, Dottie drove to the nearest store to pick up an ever-growing list. She knew she needed coffee and bread. Add to that bananas, orange juice, oatmeal, and oh yes, that meant more brown sugar. Some cheese and dried beans for her fifteen-bean soup. By the time she made it to the meat department, she had nearly forgotten her mission to find out where to buy pepper spray. Someone in this store should be able to tell me. The man pursed his lips as if to question her, but simply said, “Sure, no problem.” He returned a couple of minutes later handing her the package. “I wrapped each individually then wrapped them together on the tray. Hope that works for you. Anything else, Mam? Dottie took the package from his hand and thought a minute. “Uh…no, that’s all. Thank you.” Asking for pepper spray and getting individually wrapped chicken breasts. Could anything scream “woman living alone” any louder? “No problem.” The confident stocker went back to lining up the boxes of cereal on the shelf. The employee arranging the spices turned to Dottie. “Are you looking for something special?” the young woman asked. 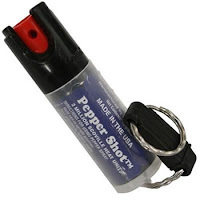 “Well, I was looking for pepper spray, not pepper. It’s a…”but before Dottie could finish the sentence, the young girl reached in her pocket and pulled out her key ring. On it dangled a small cylinder. No problem must be the store’s mantra. Now she had perishable groceries in the car. A trip to the sporting goods store would have to wait. But not for long. 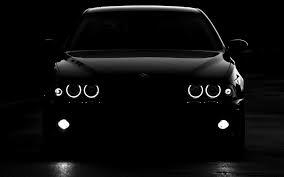 The same dark car she had seen earlier was driving slowly past her house as she turned down her street. Who was that? Was it the same car that followed her from the Barn? And, more importantly, what did he want? What is it that holds us back? We have dreams and ideas but can’t bring our vision to reality. I ask this because I had a terrible time writing this week. I lost some sense of drive. I lost interest in my projects. 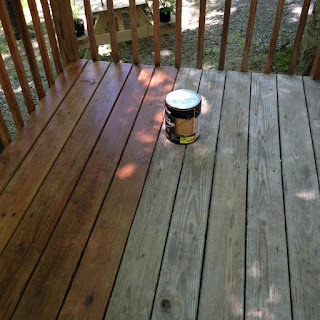 I sat down to write this blog post more than a dozen times. Nothing seemed right. Some may call it writer’s block. I don’t think that’s what it is. I have ideas. I have drafts. What was missing in all of those unproductive writing sessions was passion. I lacked a strong desire to write. But why? I’ve done a bit of self-examination and I now offer you these excuses…uh…reasons. 1. Basically, I am a lazy person. This is true. I’ve known it for a long time. It is for me a constant battle. So what do I do to combat this? I am a list maker. I usually make a list the night before for each day’s tasks. Checking items off keeps me moving in the right direction. I didn’t make one list this past week. 2. I am easily distracted. I was never diagnosed with Attention Deficit Disorder, but I wouldn’t be at all surprised if I scored high on the assessment checklist. What distracted me this week? Everything. 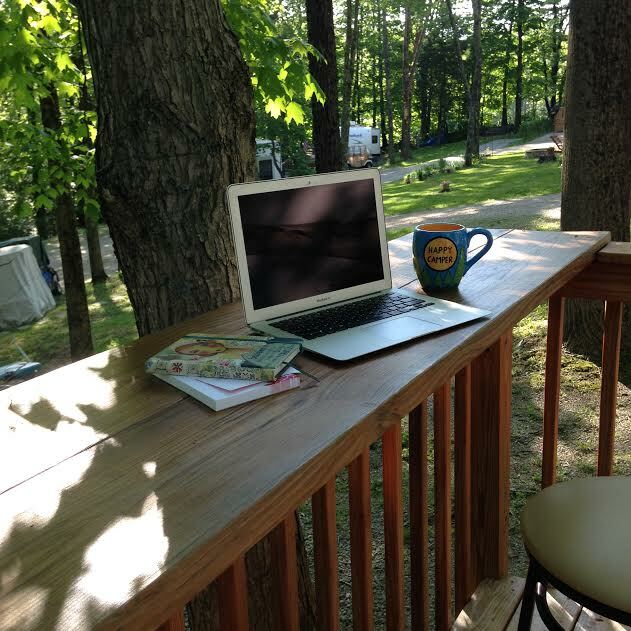 Working in the yard, staining my deck, camping, television, Facebook, invitations to go out to eat. You name it. What do I do to tackle this? I usually try to schedule time to write and treat it as a job. I can be a good worker when I have a job to do. I didn’t keep a schedule this week. 3. The weather. I can generally use this as an excuse. “It’s too hot to think” or “The cold is depressing.” How about “The rain makes me sleepy.” You get the idea. I don’t know what to say about the weather this week, though. It was perfect. Even one evening at my camper when the rain was pouring down, it was beautiful. 4. I’m too busy to write. See number two. My busyness is of my own making. I'm easily distracted by...anything. Even hard work! 5. "I don’t have anything to say." Okay, that is an excuse I can’t even pen without laughing out loud. I have plenty to say. Not everyone will want to hear it, but I have a lot to say. I currently have three novels in the works --all at different stages in the writing process. I have three children’s books I am working on and several queries for freelance articles I hope to get out this next week. Having nothing to say or nothing to work on is not an excuse you’ll hear from me. Maybe I have too much to work on… too much to say. Maybe just thinking about all I am leaving undone is making me tired. There you have it: The reasoning behind my sluggish writing behavior this week. I’ve talked with other writers. Some say they are held back by fear of failure. Others confess that they feel inadequate to the task. What holds you back? What do you do to overcome it? The third Wednesday of each month I’ve dedicated to featuring another writer. This week I have Heather Gray as my guest. She is so grounded and so delightful you are going to want to read her latest book. I decided today to put the info about Heather’s book right up front…I don’t’ want you to miss it! She saves lives. He protects them. And someone's trying to stop them both. Lily Ziminski is an ICU nurse near the nation’s capital where politics are a regular part of hospital policy. 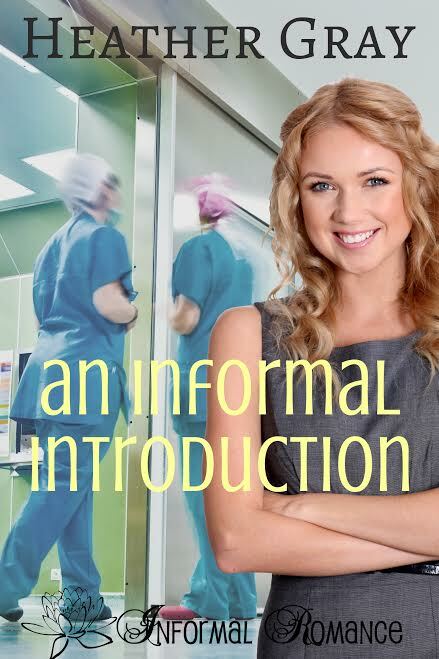 Assigned a series of high-profile patients, she finds herself an unwilling focus of the media. Lily would much rather do without all the attention…except where one cowboy-hat-wearing state trooper is concerned. Caleb Graham runs into the same captivating nurse twice in one day, and he’s not a man who believes in coincidence. When problems at a local impound lot force him into the middle of a bizarre case that threatens Lily, Caleb will stop at nothing to protect her. From a stranger in a parking garage to Secret Service agents, surprise chases Lily around every corner. In the midst of the chaos, she has two constants – her longtime faith in God, and her growing attraction for a silver-eyed trooper. 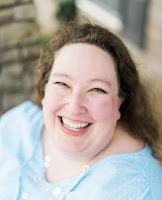 Heather Gray loves coffee, God, her family, and laughter - not necessarily in that order! She writes approachable characters who, through the highs and lows of life, find a way to love God, embrace each day, and laugh out loud right along with her. Her books almost always include someone who's infatuated with coffee, too. Some things just can't be helped. Heather delights in creating characters who like her, have their share of faults and foibles, characters who are flawed...but loved anyway. Me: Thank you so much for agreeing to be on today’s blog. Let’s get right into it. My first question I like to ask my guests is how long have you been writing? Heather: I’d love to paint a grand picture about how I always knew I was meant to be a writer. That’s even sort of true. I wrote my first story when I was in the fourth grade, and I loved the way it made me feel. I continued to write until I went to college. Then life happened. Between school, marriage, parenthood, and employment – writing just kind of fell by the wayside. The longing to write stirred to life in me again in late 2010, and I started playing with a story idea. It had been so long, though, that I couldn’t remember even the basics. Present tense or past tense? First person or third person? I started writing in the spare minutes here and there, but those minutes were few and far between. I homeschooled two active children, I worked a part-time job from my home office, and I took care of my family. Life was full. I really couldn’t imagine it being any fuller, or any better. We all deal with grief in different ways. I’ve always been someone who sorts out her thoughts by writing through them, and this was no different. I started writing that very day, and less than five months later, I sent a completed manuscript off to a publisher. It’s a fiction story, a western romance even, but even so - God and I had a lot of conversations in the pages of that first novel. Anybody who knows me well enough to understand what I was going through at the time can probably spot most of them. In any event, it’s been four years since I sat down at a computer and started writing that first story. God and I still talk to each other through the writing process. It’s one of the things I most cherish about what I get to do. Writing brings me closer to God. It allows me to look into a mirror and see the things about my own faith that I might allow myself to be blind to otherwise. Me: I totally understand that. As you know, I lost my husband in 2014. I think of my writing as a gift from God. It has helped me through some difficult days. But let’s move on. Where do you get your story ideas? Heather: From the time I was little, my head was full of stories. At night, I’d lay down to go to sleep, and I’d sort through the stories in my mind the way some people sort through books in a library. I’d choose which one to pull out. Then I’d pick up the story from wherever I’d last left off, and I’d paint the story in my mind until I fell asleep. The next night, I’d go through the same process. I wouldn’t be exaggerating if I told you I have at least a dozen stories inside of me just waiting to get out at any given time. The funny thing is, I always thought it was like that for everyone. It wasn’t until I was talking to a group of readers one time and asked them about the stories in their minds – and was met with utter silence – that I realized the head-filled-with-stories syndrome really is unique to writers (and other artists, to some extent). I wish I could tell you where those stories come from, but I can’t. They’re just always there. I’ve finally accepted that they’re a gift from God, a special part of the way He wired me. Me: (laughing) I do exactly the same thing! And I rewrite endings to movies in my head if they didn’t turn out as I liked! How long do you stick with and idea that isn’t working before you decide to discard it? Heather: I’m more stubborn than the average bear. Even though I will fight with a story to get it to the very end, I do have a couple of manuscripts that I’ve not yet published. They’re written, but something just isn’t quite right. I haven’t yet figured out what, though. I’m holding onto those stories for now, and they continue to percolate in the back of my mind. At some point the puzzle pieces will fall into place for me, and I’ll be able to unlock the mystery of what is wrong with them and what needs to be fixed. Then I’ll dust them off, fix them up, and get them into the hands of readers. Me: What was your biggest challenge after having your first book published? Heather: Ha – you sure know how to put a gal on the spot! My biggest challenge early on was simply believing in myself, believing I had a voice that people wanted to hear, and believing that the stories in my head were worth telling. To be honest, I still struggle with those same doubts from time to time. As I’ve grown as a writer, though, I’ve become more comfortable with who I am and with my place in the world. I am happy to be used by God however He sees fit to use me – whether it’s through stories, by encouraging other Christian authors, or simply by serving in my own church – anything I can do to bring honor and glory to God is worth it. Me: Great answer. So, how did you learn to write good dialogue? Most of what I know about writing – including dialogue – I learned by being edited. There’s something about having people tell you everything you’ve done wrong that makes you want to learn how to do it correctly. Be it dialogue, narrative, point of view, or any other aspect of the craft of writing – I know what I know because editors have taken the time to invest in me, to point out my errors and to answer my questions when I’ve asked why something was incorrect. Second only to working with editors is reading. Reading well-written books and dissecting what makes them so fabulous. If an author has captivating dialogue, ask yourself why. What makes it so special? If another author has a way of pulling you into the story from the very first paragraph, find out why. Study what he or she is doing and learn from it. Read books written by people who are amazing at what they do, and be willing to learn. Me: That fits perfectly with the post I put up last week on editing. (After the Draft) Heather, Thank you so much for being my guest on A Novel Creation. I count it a joy to get to know you better. Heather: You are welcome! One more thing I would add. I know a lot of your readers are aspiring writers. By its very nature, publishing is a challenge. I’d say the most difficult part for me personally, though, is opening myself up to judgment. Every single time I send a book out there into the world, I am opening my work – something I’ve poured my heart and soul into – up to judgment by others. And the reality is, not everybody is going to like a book. That’s okay. The writing part of this career is fun. The rest of it is work, but the writing is pure pleasure. Writing…feeds my soul. I hope it can be that way for you and your readers as well. Me: Thank you! Now readers, it’s your turn. Feel free to ask Heather those burning questions you have for her or to comment on the interview. She’ll be happy to respond. Editing. I called this piece After the Draft, but actually editing is an ongoing part of the craft of writing. There is rarely –likely never –a “one and done” writing project. There are levels of editing as well as many types of editors. It behooves the novelist to become his or her own first editor. Why? Because hiring an editor can be costly and without a careful combing through the manuscript, a publisher will not be able to look past the awkwardness or errors to see the magic of the story you’ve weaved. The purpose of this post is to examine the types or levels of editing and to point authors in the direction to complete as much of the editing as possible before releasing the manuscript to a professional editor or potential publisher. This is considered the lowest level of editing. Don’t let that fool you. Without it your manuscript will die and untimely death in the “circular file.” Copyediting or proofreading is the type of editing that looks mostly at mechanics: punctuation, spelling, basic syntax such a noun verb agreement and so forth. Remember the dreaded red pen your high school English teacher used to mark up your grammar usage and deleted that extra comma here and there? Learn to embrace it. In fact, buy your own red pen. Read through your manuscript. Not once. Not Twice. Read through your manuscript a minimum of three times. One of those times should be out loud. When you read out loud word for word, you will find missing words, awkward sentence structures, punctuation that needs repair. I know some writers who actually read paragraphs backwards to make sure everything is spelled correctly. You see, our minds play tricks on us. We know what we wanted to write, what we meant to say, and we tend to read what we intended instead of what is actually on the paper. Secure a Beta Reader. A beta reader is not a professional editor. It is a person you trust to read through your manuscript and give you feedback. The beta reader (or an alpha reader) will likely catch spelling, punctuation, missing words, and even sentences that don’t make sense. A good beta reader will offer you a critique of your work that will help you polish it. A beta reader may be a friend, a fellow writer, an avid reader (Though my experience with avid readers is that they often get caught up in the story and forget their job!) or maybe your former high school English teacher! Educate Yourself! Yep, study. Break open a book on grammar and punctuation. Take a class. Make it a topic of your next writers group. You will be surprised at what you can learn on your own and from fellow authors. And by the way, don’t be surprised if you sit in a room of English teachers and can’t find three who agree on the use of the comma. Line editing or content editing is more advanced. Though some sentence structure issues may arise in the proofreading stage, the clarity and flow of the manuscript overall is addressed through good content editing. You can hire someone to assist you with content editing. 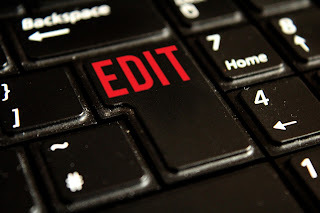 A good editor will not only help you make changes, but will teach you how to assure you are consistent with your point of view, plotline, and characters. A good content editor will give you tips on how to tighten what you’ve written and to keep the pace of the story moving along. First, read good books. Reading helps you recognize good story lines and great flow of the manuscript. It helps you think about technique and story structure. You will gain a feel for sentence structures that work. Reading is one of the best ways to improve your own writing. You can also join a writing group/critique group. Working with other authors will help you hone your own manuscript and because you are working with writers, they will help you bring your editing skills to a higher level. I also recommend you put your completed manuscript away for a few weeks. Distance yourself from your story. You will find when you read through it again, you will see it with fresh eyes. Though the suggestions I offer here will serve you well, you may need a professional editor for more substantial changes or fixes. You or your publishing house should hire a reliable editor to work with you. If you are planning to publish independently, hire a professional editor. If you find yourself meeting with rejection after rejection from potential publishers, hire a professional editor. If you feel unsure of yourself or it is your first attempt at writing a novel, hire a professional editor. 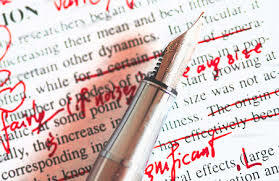 Do everything you can to get your manuscript into the best shape possible then hire a professional editor. Yes, it is an investment but one that will bring you success. There are many good editors out there. I recommend A Little Red Ink. Click HERE to read more about their services. 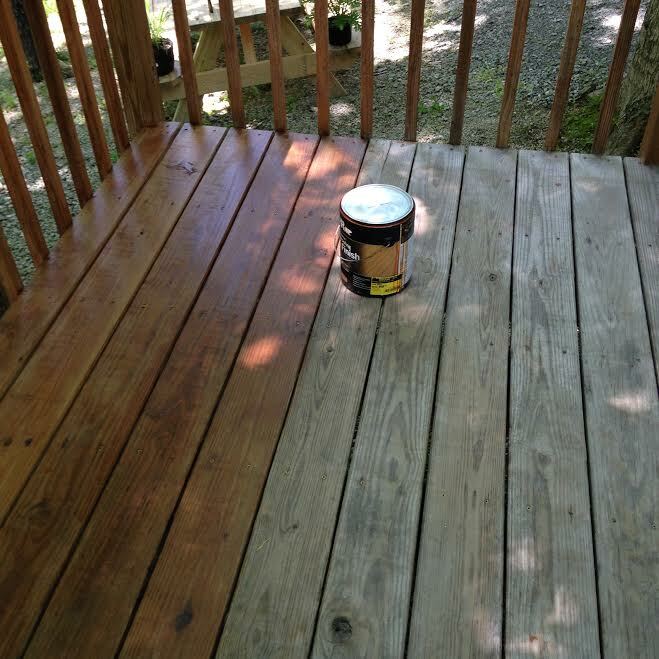 Run by two sisters, they are fast, affordable, and do an excellent job. For large manuscripts they even offer a few pages free so you can see if you and they are a good fit. I write this post for all of you writers out there. And for me. You see, I need to be reminded of the power of good editing. Comments? What have you learned about your writing or yourself as you edit your work? Oh...and be sure to drop in next week. You will not want to miss my interview with author Heather Gray. Take a look to the right to sign up for email notifications of this blog. It comes out every Wednesday.